Minnesota took down Nebraska on the road but only after things stretched all the way into double overtime. Long story short, Kailee Sharp made a hell of a save and Kellie McGahn, Molly Fiedler, and Julianna Gernes connected for a fantastic finish. The win clinched a third place finish in the Big Ten and a home match against Wisconsin on Sunday. I talked with Molly Fiedler and Kailee Sharp to see how the team is preparing for the start of post-season play. My take on the criminal mistakes for the full award list: Emily Heslin not listed at all is a felony. April Bockin being placed on third team is a felony. Gernes not listed at all is a felony. 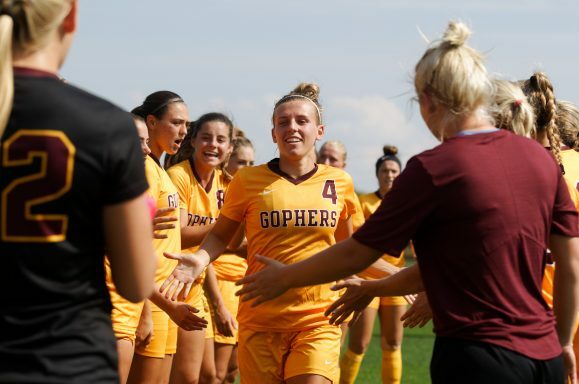 As far as misdemeanors, I personally would’ve considered at least one more Gopher defender (pick your favorite, they’re all great) on the Third Team as well as Athena Kuehn for the Freshman Team. You certainly could have talked me into Kailee Sharp on the Third Team considering the three keepers listed there.